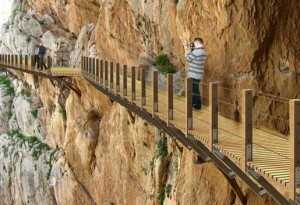 Interesting news coming from Malaga province of Andalucia with the Caminito del Rey or “Kings path” almost about to reopen. The Caminito is famous to climbers and adrenalin junkies the world over after the death defying video was loaded onto you tube in 2009. The pathway was originally built over 100 years ago, pinned to the side of the Gaitanes gorge to get materials and to allow for inspections between the three Guadalhorce dams. But now, with a total investment of around 11 million Euros, the broken and dangerous path has been restored and is due to open to the public in January 2015. Not without it’s polemics as local climbers (and worldwide) are complaining that their favorite European radical climbing site will be spoiled with the influx of thousands of us ordinary folk wanting to walk the new and safe path. Time will tell what happens but one thing is for sure, this tiny village of El Chorro needs to get ready for mass tourism fairly quickly. Following a rather sensational article in El Pais, an interesting polemical discussion is currently going on in the Spanish press. The original article centres on the dangers of bears becoming accustomed to human presence and approaching villages and their food sources, such as beehives, with the ensuing possibility of attacks on humans that this could incur. It refrains from mentioning that, in the north of Spain, bears and humans have lived side by side for hundreds of years resulting in no, or very little, danger on the part of the humans. In fact there exists a certain admiration and respect among the people of the Cantabrian mountains for their Ursine neighbours. The article also omits the very important factor of the lack of carrion around (an important part of the bear’s diet) due to the BSE laws enforcing the removal of carcasses from the countryside. Another concern raised is that foreign tour companies, in particular the British wildlife tour company Naturetrek, are endangering the future of the bears by disturbing them in their natural habitat. Naturetrek deny they cause the bears any disturbance, a spokesman stating that their tours look for bears at a distance using public footpaths, though they don’t guarantee sightings. The Asturian tourist board and ecologist groups are of the opinion that this kind of tourism is endangering the growth and survival of the precarious Cantabrian brown bear population. However, bear specialist organisations and the mayor of Somiedo all envisage a future of guided and regulated wildlife-watching tours contributing to the local economy without disturbing the bears. A delicate balance. It is increasingly difficult for shepherds to make a living these days, and without them the landscape and biodiversity they help to produce would be seriously affected. Ways must be found to increase the earnings of shepherds and to compensate them for the work they do. In Catalonia for instance there is a pilot scheme which pays shepherds to graze forests thus cutting down the undergrowth and reducing the risk of fire. They are also employed to detect and warn about fires. Another way forward is the great initiative by a group of Aragonese shepherds in the Medinaceli and Calatayud area. Ser Pastor por un Día, offers you the chance to go out for a morning or afternoon with a shepherd and a biologist and learn about the different skills involved in shepherding, mastiff dogs, local sheep breeds, shearing, lambing and the landscape they help to create. Knowledge of some Spanish is probably a must. Tel: 659 834 121 or visit Ser Pastor por un Día. I intend to sign up one of these days. Stressed out city folk have found a new way to unwind – becoming a shepherd for the day and tending flocks of sheep. Caring for lambs at a remote hillside farm has become popular for urban Spaniards who want to rediscover nature. Jesús Valtueña, a 44-year-old vet and sheep farmer, charges urban visitors €10 (£8) a person a day to tend a flock of 1,200 Aragonese sheep at his farm in Monreal de Ariza, in north-eastern Zaragoza province. “The point is for people whose families may have had some connection with the countryside in the past but who now live in cities to come and re-establish that connection, perhaps showing their children sheep,” says Valtueña. City dwellers and their children flock to the farm in January, May and September, the lambing season. When they arrive at the Pastores por un dia (Shepherds for a Day) venture they meet Valtueña’s eccentric partner, Miguel Garcia, a 20-year-old goat de-horner, or descuernacabras – the man who by tradition clips and trims the horns to stop goats wounding each other in fights. Garcia believes he can tell the sound and timbre of the bells on each and every sheep in the flock. Half the lure of the farm (pastoresx1dia.com) is that Valtueña and Garcia let the flock roam and graze over various fallow fields and pastures, a traditional method of shepherding typical to the area for hundreds of years. It is not so typical now, however. Valtueña is the last shepherd in the area, his neighbours having turned to easier-to-manage cereal crops. I stayed in this lovely house which is part of a working farm on the edge of the Sueve Mountains in Asturias this August and fully recommend it. Cristina and her family are very friendly and knowledgeable about the area and nature in general and pointed out the herd of roe deer which grazed in the back field every evening. They have fresh-farm produce and free-range eggs. Fox and wild boar (which I saw very close up) are common. Barn owl in the chuch tower opposite. The house lies between the picturesque hamlets of San Román and Villa, the latter with a great bar. The countryside is idyllic with rolling hills, green fields and lovely villages each with their quota of hórreos, and there are wonderful views of the Sierra de Sueve. The blight of eucalyptus is almost absent. 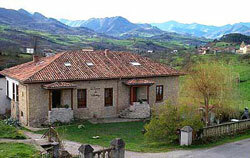 I’ve added this lovely rural hotel in the Peñarrubia Valley in Cantabria to the rural tourism directory. Excellent birdwatching of Spanish raptors (griffon vultures, golden eagles, short-tailed eagles, buzzards, peregrines, booted eagle, eagle owl, and in spring and summer, Egyptian vultures.